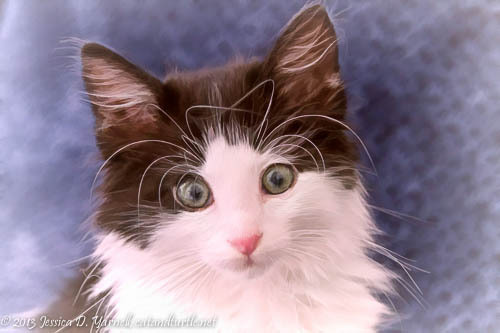 Whiskey Loopy is proud to announce that his kitten story is now available along with Goldy’s and Squirt’s! So when I moved out and got my cat Goldilocks, she and I made a little “I am a Kitten” book for my dad for Christmas. “I am a kitten, my name is Goldilocks, I live in a pleasant apartment in Orlando…” We illustrated it with pictures of us in our new apartment – Goldy helping in the kitchen (and in the refrigerator), Goldy looking out the window at me when I came home, Goldy visiting her sister Missy at my parents’ house. I then transferred the contents of the book online when I started catandturtle. Along came Squirt, and of course he needed to tell his story too! “I am a kitten, my name is Squirt, I live in a pleasant condo in Orlando…” Make sure you check out the picture of our little remote king! Finally it’s Whiskey Loopy’s turn. He’s been a resident in our house for about a year and a half now, and he told me it was high time that he had his own story! “I am a kitten, my name is Whiskey, I live in a pleasant house in Orlando…” We went through our pictures and pulled out the cutest. I thought it was funny that about half of the images were made with my “good” cameras, and the other half are iPhone snapshots. It goes to show that sometimes the best camera is the one that is available to capture the moment! Whiskey Loopy hopes you enjoy some of his favorite moments.